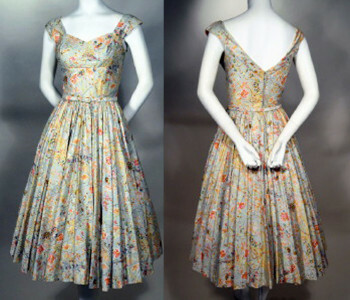 Floral print 50's vintage full gathered skirt sundress. Light gray with muted rose, and gold glazed cotton. Wide straps extend down as shelf bust with pleated inset and sweetheart neckline. Straps fold and form V "collar" at back bodice. Fitted fully lined bodice. Center back metal zipper. Full gathered skirt. Side seam pockets. Self belt. Calm vintage floral print in a lovely classic summer sundress!! Bodice length, measured back from shoulder to waist - 15 1/2"
Skirt length, measured back from waist seam to hem edge - 30"
Near excellent! Shows some shadow soil marks at left & right bodice edge under arm. Bodice lining shows age discolor. Would benefit from professional cleaning.